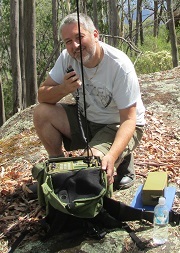 As I don’t have any radio equipment set up at home, going portable is the only way I can get on the air these days and as a SOTA activator and chaser I like to get out and about with my radio gear as often as I can. I spend a fair bit of time studying maps and the SOTA Summits lists working out where I’m going next, and as a result of that I’m not only getting on the air much more than at any time in the past 15 years but I’m also finding new places and getting to know the countryside around my home town of Albury far better than I would otherwise have done. I’ll add a page here for each of my expeditions, most of which will be Summit activations. I’ll include maps, photos and access notes where I’ve got them, which I hope will make it easier for activators who follow me. If you read anything on these pages that you’d like to know more about, drop me a line. Likewise if you spot something that’s wrong, or has changed since I wrote about it, please let me know.